The original Greenwich Village was a Canarsee Indian fishing village called Seppanikan (some accounts spell it Sapokanican), centered around a stream they called Manetta, meaning ‘devil water’. Later it became Minetta Brook; Minetta Street is located over the brook today. The site was later occupied by the Dutch, under whose governor Wouter Van Twiller made it mainly a tobacco plantation. When Manhattan Island was taken over by the British, they called it Greenwich, possibly for the London suburb which is now the starting point for the world’s longitude. When NYC adopted a rigid grid plan for its streets in 1811, Greenwich Village was allowed to maintain its rather confusing street pattern–largely because it had been isolated from the rest of the city by a yellow fever and cholera epidemic in the early 1800s. The street pattern of the Village is largely the same as it was in the late 1700s-early 1800s with narrow cart paths better suited for foot traffic than automobiles. Here’s an excerpt from an 1801 Mangin-Goerck Plan or Map of New York City, compiled from before the 1811 plan was adopted. Many of these streets existed only on paper at the time, but the map shows the beginnings of the Greenwich Village known today. 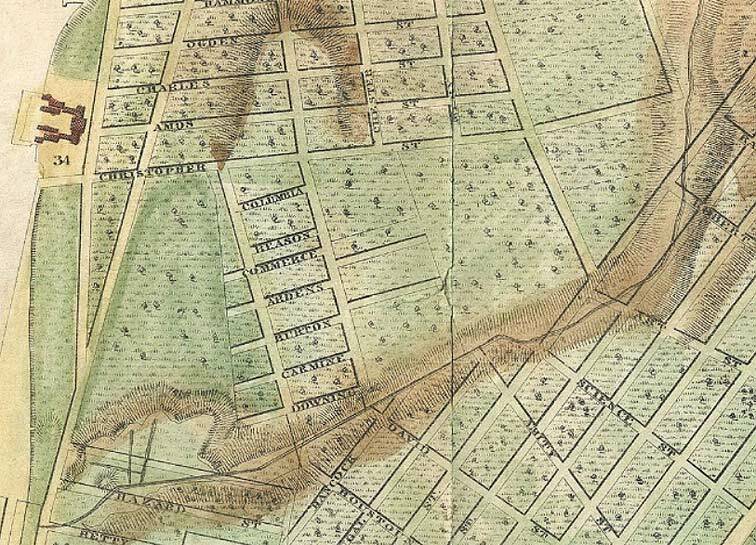 At the left of the map, shown here as #34, is Newgate Prison, which stood in the West Village between 1797 and about 1828 at the Hudson River shoreline, bordered by Washington, Christopher and just south of where Perry Street would later appear, some of these streets created from landfill. Newgate was NY State’s first penitentiary, and pioneered radical correctional policies such as allowing prisoners light in their cells, water to bathe, no corporal punishment, visits from families, and rehabilitational training. By the late 1820s, the prison was no longer isolated and was surrounded by streets and businesses, and transferred to Ossining in Westchester County, the prison known popularly as Sing Sing (land on which the prison was built was called Sintsink by the Indians). Christopher Street was an original east-west road in Greenwich Village. It was originally Skinner Road, named for Colonel William Skinner, whose father-in-law, Peter Warren, owned much of Greenwich Village in the colonial era. In many ways Christopher Street can be called the main east-west street of the Village, as it existed as a road to the river long before its parallel streets were laid out. When Charles Christopher Amos purchased the plot in the early 19th Century, he had the three streets laid out from east to west named for him; “Amos” has since become a western extension of West 10th. Note the crowd of short streets south of Christopher. These are still in place today, notably Reason Street, named for the Thomas Paine Revolutionary-era pamphlet “The Age of Reason.” Paine lived in the area for a time, and died in a woodframe house at #59 that is now the site of the Marie’s Crisis music bistro. Since area residents, with their distinctive accent, were calling it “Raisin Street” it was decided to rename it for artist Thomas Barrow, who in 1807 made a popular print of Trinity Church, which owned a lot of Manhattan property at the time. Just south is Commerce Street which retains the name today. Unlike some popular histories the short street was never named Cherry Lane; that name was made up by one William Rainey, one of the investors who along with Edna St. Vincent Millay founded the Cherry Lane Theatre in 1924. Also seen is Columbia Street, which has undergone a number of changes, to Cozine, Burrows, and finally Grove in 1829. 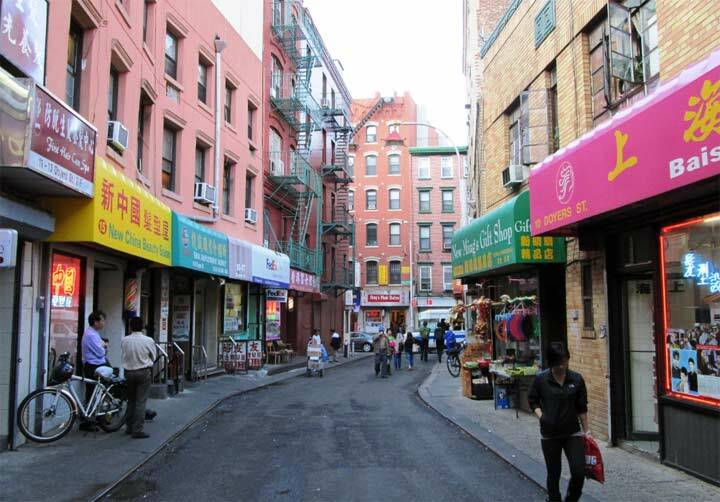 There is a separate Columbia Street in the Lower East Side. Much more on NYC’s changing map in an excellent article in Medium by Chaz Hutton. Had a great time on the tour yesterday, thanks for having us! Russell Shorto in “Island in the Center of the World” says that that the Greenwich Village name came from a Dutch settler who came from the “Long Island village of Greenwyck” (Pine District) who settled in Noortwick and renamed it after his village. This 1676 Dutch map shows Greenwyck around today’s Bay Ridge but I couldn’t find anything else about it. Named after William Houston, not Sam Houston (like Houston, TX), and that’s how his name was pronounced.